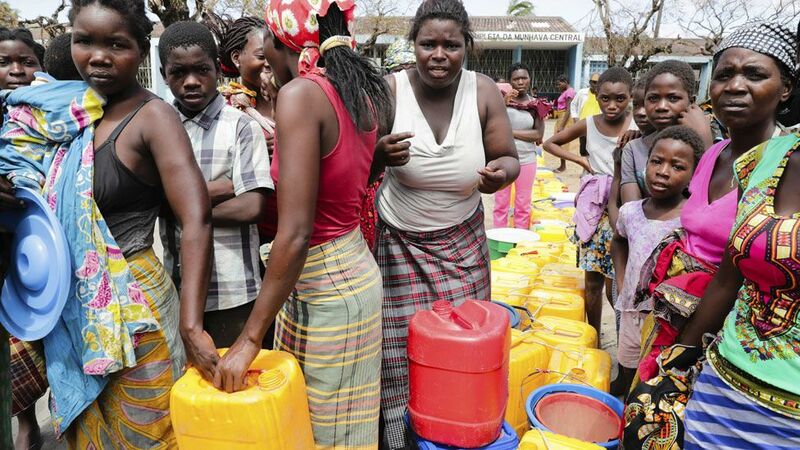 Water supplies have been cut in Beira since the cyclone hit (Image Credit: BBC World Service). THE number of casualties and people affected by Cyclone Idai in southern Africa looks set to rise from the two million currently estimated. Rain is still falling and the waters is rising in some areas. The destruction of roads, bridges and communications means that some areas are still completely cut off. Search-and-rescue – and eventually aid and recovery – are being greatly hampered. Oxfam’s initial aims are to reach up to 500,000 people with aid, including clean water and emergency food, including in partnership with other international and local NGO partners. Oxfam’s Country Director in Mozambique, Rotafina Donco, said there were people flooded from their homes and now in transit camps who hadn’t eaten for days. She said some people were still waiting to be rescued, clinging to treetops or on mountainsides. Mr Makina said the camps were full of women during the day awaiting their husbands and sons to return that evening with whatever food they had been able to find. He said some communities were only able to be reached by helicopter or boat. The cyclone, with winds of 170km/hr and heavy rains, hit the port city of Beira in Mozambique, where 90 per cent of the land is under water and communications are cut off. In Zimbabwe, where over more than 80 deaths have been officially recorded so far and hundreds more are still missing, roads are impassable and rescue helicopters grounded because of bad weather.